Tapas. Creamy goat cheese. Cured chorizo. Sangria the color of a setting sun. Boqueria is a wine and cocktail bar plucked out of the Catalan countryside and replanted on the corner of 19th and M. In addition to their finely crafted cocktails, they have the sort of food that makes you want to add to your order every time the waiter passes by with a different plate. Happy hour features $4 drafts and all tapas under $6 from 3 pm-7 pm, Monday thru Friday. This lively twist on the classic Irish pub is as warm and inviting as your favorite whiskey. And no matter what your favorite is, they definitely have it. The Irish Whiskey houses a massive menu of over 80 whiskeys and 50 beers. They also have, perfect for the fall months, a patio fire pit that can be perfectly paired with a $5 DIY smores kit and Jameson-spiked Irish hot chocolate. Happy hour is from 4 pm-7 pm Monday thru Friday. Relax on one of the velvet couches in Central Michel Richard’s lounge from 5 pm-6:30 pm Monday thru Friday for daily specials including $3 sliders and $9 cocktails. The cuisine combines well-known American favorites (fried chicken, short ribs, and banana splits) with French influences, making for a delightful dining experience. This bar exudes class and is the perfect place to take clients for drinks and a true DC experience. Chads is a DC institution perfectly located for after-work drinks. This subterranean bar lets you escape the hustle of the streets above and enjoy some barrel-aged relaxation. 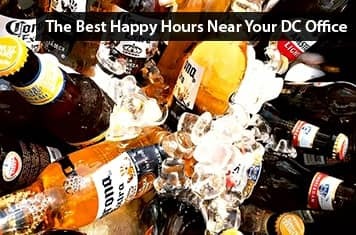 Their happy hour offers daily specials, including an "extended happy hour" on Monday nights (4 pm -11 pm) featuring $2.95 domestic beers, house wine, and rail drinks. Every happy hour listed above is within walking distance of one of our two AdvantEdge locations- so grab your coworkers and head out for one tonight!